This is one of the most touching novels I read in the last couple of months. I was VERY impressed by it. One of those books you hate to have reached the end of. The military part sounds convincing, there is invested in world building and in a growth of the people's minds and characters. Malcolm Redwing is a captain in the British army and stationed in Camp Bastion in Afghanistan. While he was a lonely boy and student he feels very much at home in the army and is best friends with Charlie his bunkmate. Tall, blonde, gregarious, handsome Charlie. Malcolm himself is rather short, had dull brown hair and grey eyes and is not that handsome. He has come to a time in life he has to decide to stay in the army for another couple of years or do what his handsome fiancee Rachel wants and become a civilian. But then his commander asks him to stay in Afghanistan a bit longer and do some covert work in a forwarded base. When Malcolm tells Rachel she turns into a mad cat and tells him she hates him playing soldier and having a hero complex and ends their relationship. Flabbergasted Malcolm changes his next of kin into Charlie and boards the chopper. A chopper that crash-lands and all Malcolm remembers is sliding into a hole. When he comes to he is shackled and wounded. A chestnut haired, brown eyed woman is taking care of him. He thinks he must be somewhere deep inland in Afghanistan and is surprised he cannot understand a word of what the people are saying but he hopes and prays they will not hand him to the Taliban. What he does not know is that he is the first person with grey eyes those people have ever seen. Only gods have grey eyes. They themselves have mostly blue eyes apart from a few people like Jessa the healer who has brown eyes and is thus regarded as a second class citizen. What he also does not know is that the tribe suspect him to be one of "the Others" a mysterious enemy in the south. They plan to torture the truth out of him. All of a sudden the village is attacked and about to be slaughtered with most men still on a hunt. The leader of the remaining warriors cuts Malcolm free and with his military training he manages to help him save the lives of the villagers. Malcolm thinks he is lucky. But when he walks out of the tent in the evening he freezes. In the sky are two moons and not a star looks familiar. Malcolm realises he cannot be on earth but has no clue how he got there. The novel reminded me a lot of stories like "Dances with Wolves" but later on I also recognised the influence of the Mongol and Chinese. It is a nomadic culture centred around horses. The stallion of the herd decides where to go and the mares and the people follow. Also their view on fertility is seen in horse's terms. The women have fillies in their belly and the spirit-sire gives those life. The men of the tribe are normally invited by the women to share their tents on occasion. So it is seen as very strange that Malcolm always sleeps in Jessa's tent even after he is completely healed but no stallion sounds are heard. Unlike in most modern novels here the relationship between Jessa and Malcolm develops very slowly and genuinely. The same applies for his relationship with the rest of the tribe. Or with us as a reader. You really feel ties to both Jessa and Malcolm. What is also very well done is the ending. I am not saying a word but let me tell you it is quite uncommon. I can strongly recommend this novel. It deserves a lot of readers. And what the last loyalty is? 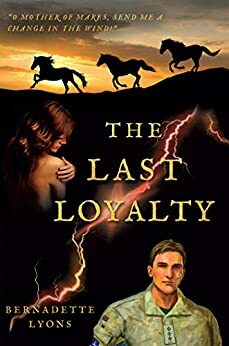 Is it Malcolm's loyalty to the army, the loyalty of the tribe towards him or Jessa's lasting love?